Free first aid training courses on emergency bleeding control will resume starting Oct. 20 at Harborview Medical Center. 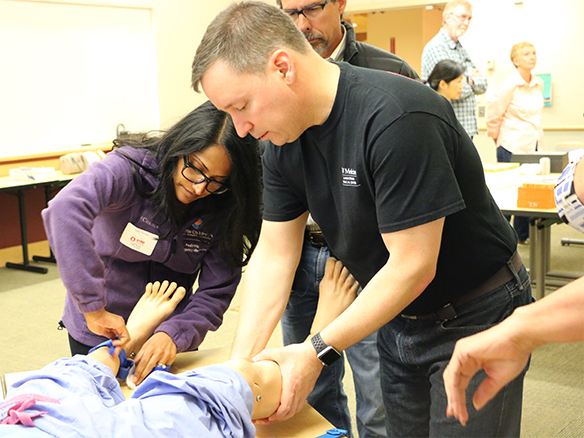 The two-hour sessions cover knowledge on how to identify potentially lethal bleeding injuries and hands-on practice with tourniquet and wound packing. Stop the Bleed training sessions at Harboview Medical Center in Seattle will be held on the following days, with session options at 8 a.m. and 10 a.m. Registration is required. Additional dates in other locations around Washington are also available, presented by the City of Seattle, Lake City Emergency Communication Hub, EvergreenHealth Medical Center in Kirkland, and more. Learn more or register at StoptheBleedWA.org. The national Stop the Bleed program is an initiative of the American College of Surgeons, the Committee on Trauma, and the Hartford Consensus. It is intended to equip the public with bleeding control techniques in the event of an emergency. Victims with uncontrolled bleeding injuries can die in 5-10 minutes, but prompt, informed responses from bystanders can buy valuable time for medical personnel to arrive. Learn more about the national program at bleedingcontrol.org.